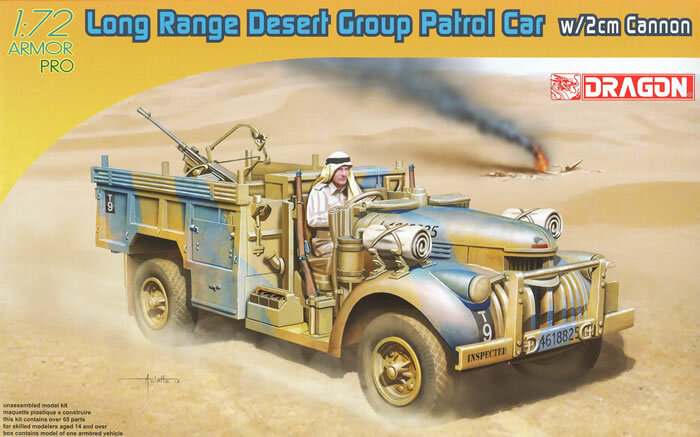 Following on its first release of a LRDG Chevrolet truck based on a cut-down 1941 Chevrolet light truck with military body and sand tires, DML has now released a second version fitted with a captured 2 cm Breda gun. The Cannone-Mitragliera da 20/65 modello 35 was an automatic 20mm antiaircraft gun that like its German 2 cm Flak 38 counterpart could be used for anti-material and antipersonnel tasks as well. It could fire 200-220 rounds per minute and was in wide use. It was quite popular with all sides and the British fitted them to captured vehicles when possible to increase firepower. This is a virtual repeat of the earlier LRDG kit (No. 7439) but with a new sprue for the Breda parts. It captures the personality of the ‘41 Chevy (which once again due to trademark demands is now called a “Patrol Car” rather than a Chevrolet truck) and the British military pattern body. It still comes with two Enfield rifles, a Lewis gun with cooling jacket on a pedestal mount with separate drum, a “flimsy” of gas (only one!) and the rolled tarps on the front fenders. No radio is provided but it also comes with the lockers as separate parts, a sand channel and tent poles for the canvas. The cab is neatly done with the modified grille shell and a false radiator front that mounts behind them to be visible. There are no pedals in the control area, nor any engine or transmission upper bits. The chassis is simple with a one-piece driveline, separate springs and front axle, and separate exhaust. But the wheels are still only half-molded with no back sides, which is surprising in this day and age with the molding skills DML possesses. Oddly enough a back side and wheel rim are clearly evident on the directions. The gun comes with a solid muzzle flash hider as DML used the other end of the mold in a slide in order to provide twin separate hand grips; this is actually a smarter idea as it is easier to drill out a muzzle than separate grips. It comes with the intricate leverage frame for aiming the gun that balanced it and the oversized traverse wheel for rapid tracking. Finishing directions are included for two vehicles: “Te Aroha”, T Patrol, Libya 1943 in the “Caunter” scheme , and an unidentified vehicle in sand, green and pinkish brown with no markings. A set of Cartograf decals is included along with a number jungle for census numbers for other vehicles. Overall the gun is a nice improvement but it still seems more oriented on wargamers model than scale modelers.